This entry was posted in event, movie, project evolution, screening. Bookmark the permalink. I am super looking forward to your films. 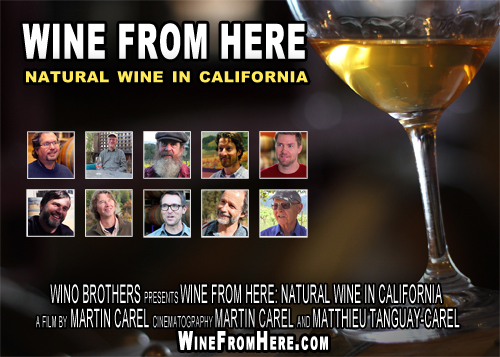 As a documentary filmmaker focused now on organically grown wines (over at http://www.winecountrygeographic.com – I write about organically grown wines) I am so happy to see some of my favorite folks in the film. However, I am mystified as to why the post film tasting would take place at a wine bar that has done so little (as most of our hip, terroirist wine bars) for the people and wines from HERE. They are just focused on French and other European natural wines. I am glad they’ll be serving the local wines at this event, but doesn’t it seem strange to you that they usually DON’T serve these wines? I am also mystified as to why the natural wine movement here pays so little attention to certified organic grapes and wineries. This is very important. Thanks for your comment Pam. But I want to highlight that Heart, one of my favorite natural wine bars in San Francisco, has carried several natural wines from California (e.g. La Clarine, Clos Saron and Broc Cellars). Jeff Segal, Heart’s founder, is a friend of mine and one of the organizers of the third edition of San Francisco’s Natural Wine Week. In other words, Heart was the perfect venue to celebrate an important milestone of a project I have been working on for almost a year of my life! I think you should come and party with us on August 25! Yes I will definitely be there! I am happy to hear about your film, but I am still mystified as to why the “natural” wine making movement does not embrace organic certification. It’s really important, it’s super cheap, and I don’t see the reasons for not getting certified. Just to clarify, none of the wineries you’ve just mentioned use certified grapes or are made in certified wineries. And there are lots of natural winemakers who ARE organic – like almost all the biodynamic wineries. I plan to pour our Clos Saron wines at Heart as well. In relation to organic and/or biodynamic certification – for us the question is why do it? These are organizations with their own rules (created by whom? how objective? ), agenda, interests, in short – politics. I do not mean in any way that they are “evil”, and yet I ask what would adhering to any such set of rules (simply in order to get a certification) add to the well being, health, and integrity of my land, wine, farming, my life? I have more respect and valuation for people who work their land following their own observations, experience, conscience, and hearts than to any organization, group philosophy, pre-determined rules, or religion, no matter how well intended.